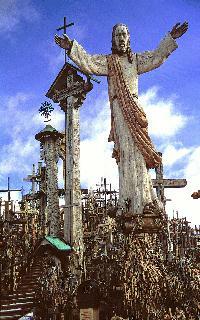 The Hill of Crosses is situated in northern Lithuania, close to the border with Latvia. The Hill is a witness to the religious devotion of the Lithuanian people and to its continual fight for independence. The beginnings of this remarkable hill are shrouded in mystery. No one is really certain how or why this hill became a monument to Christ and to the Lithuanian nation. The site was first mentioned as early as the 14th century. In more recent times, the Hill has become a source of national pride. This occurred during 1831 and 1863, when anti-Soviet uprisings occurred, and once again during the 50 year Soviet occupation of Lithuania, which began with the second world war. The Soviets bulldozed the hill three times and dug a ditch around the hill to stop anyone from entering this site. Yet people continued to plant crosses. 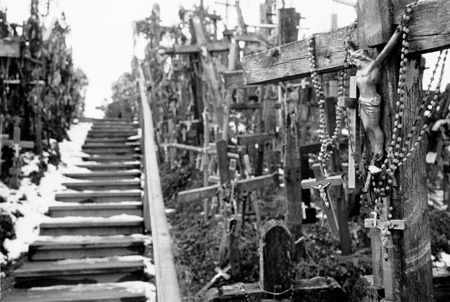 Planting a cross was considered a punishable crime by the Soviets, yet crosses continued to appear. 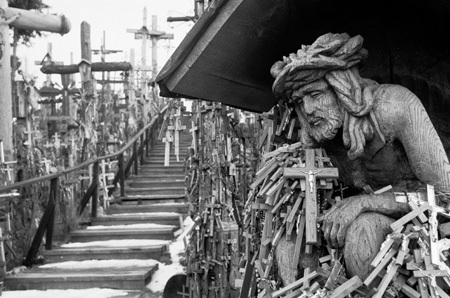 In 1991, with the advent of Lithuanian independence, the Hill of Crosses became a national symbol of the fight for independence. At that time, an estimated 35,000 crosses were already laid, varying in size from a few centimetres to 4 meters. The Pope John Paul�II paid homage to the site in 1993 and donated a statue of the crucified Christ. Today, the crosses number in the hundred of thousands. This eerie place attracts both locals and tourists. 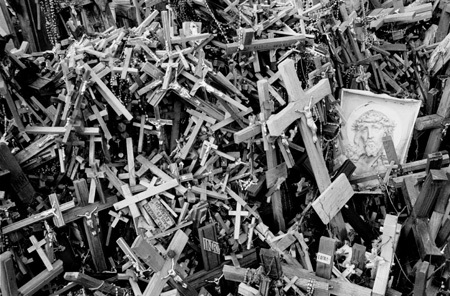 Walking among numerous crosses, some decorated with devotion to loved ones, one can hear the rosaries rattle in the wind. This little hillock has long been a potent symbol of suffering, hope, devotion, and the undefeated faith of the Lithuanian people.